No reservations needed for this elegantly designed table. RSVP will invite guests in and is perfect for any hospitality needs. Woodgrain round Table Top made out of 1" high pressure laminate. Edge is finished with 3mm vinyl t-molding in black. For Use with Safco Products Fixed Base Model 2656 or Pneumatic Base Model 2655 in Black or Silver (sold separately). The bases can be used with multiple tops that come with four glides on each base. If you want the possibility of easy mobility you can simply add casters Safco Products Model 2660BL (sold separately) to either base while keeping the overall height the same. 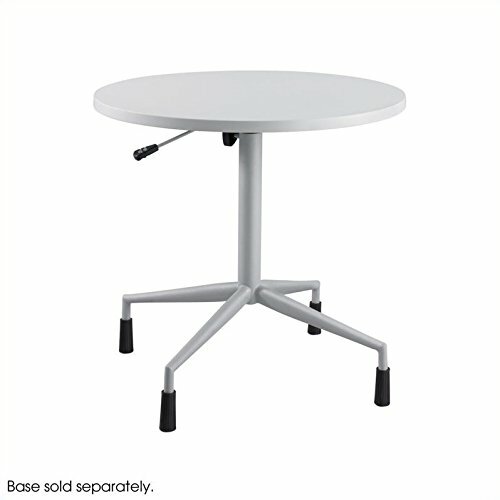 The Pneumatic Base Table adjusts in height from 27 3/4" to 36 3/4". The Standard Fixed Table's height is 29" overall. RSVP is ready for every guest, no need to call ahead.